In the year 1924 a soldier brought Mahjong from China to Japan. The first Mahjong club was opened in Tokyo and the popularity of the game increased drastically. Over time, the chinese version of the game was first notably simplified, then the complexity was increased again. Nowadays, Riichi Mahjong is the most popular table-top game in Japan. In 2008 there were around 7.6 million Mahjong players and around 8900 Mahjong studios in the country. At our club, Riichi Mahjong is by far the most popular game too and we have a ladder ranking as well as a Kyū/Dan system to measure player strength. Shōgi is the japanese version of chess. Chess made its way to Japan over China, Korea or Burma and Malaysia in the 8th century. Over there it changed in various ways. Shōgi tiles can be promoted or you can use tiles you captured from your opponent for your side for example. 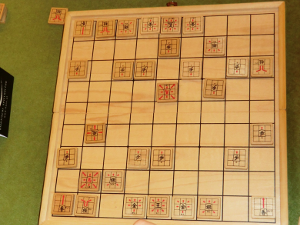 Goita is originally played with 32 Shōgi tiles on a Go or Shōgi board but there is also a version with playing cards. To make it easier to understand and play for people who can't read Kanji the cards also contain the terms in latin letters. 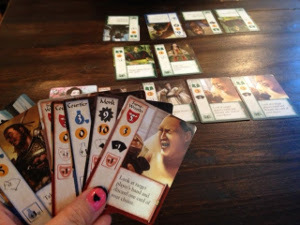 You can also play the card version on a regular table. The roots of Goita go back to the 17th century. The game developed from Uke-Shōgi, a game that was played in short breaks between Shōgi sessions. Mai-Star is a modern card game about Japanese Geisha. The player takes on the role of a Geisha and tries to win the legendary title "Mai-Star". You need to increase your popularity with the help of other people to be able to serve more sophisticated guests and thereby earn more money. Mai-Star is no traditional game but it is very popular in our club. 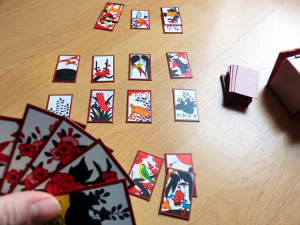 Hanafuda are Japanese flower-themed playing cards. The cards are a little thicker than the cards of western card decks. Similar to rummy cards you can play various different games with Hanafuda. 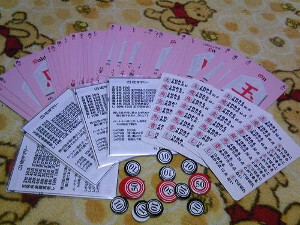 The most popular games are Hachi-Hachi and KoiKoi, a fast card catching game for two to four players. KoiKoi is one of the most widespread games and is popular not only in Japan but also in Korea, Taiwan and Hawaii. 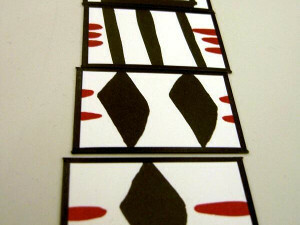 Kabufuda is - like Hanafuda - a Japanese card deck. It consists of 40 cards which are numbered from 1 to 10. 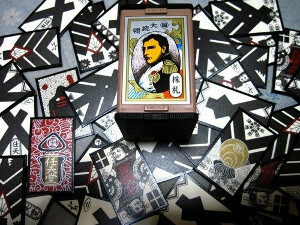 With Kabufuda you can play Hiki-Kabu or Ochio-Kabu, wich is similar to Black Jack. In this game, the combination of the numbers 8 (ya) – 9 (ku) – 3 (sa) is worthless. The Yakuza took their name from this combination. Tehonbiki is a game of luck which is especially played by the Yakuza for big money.That is why the game has a very bad reputation. Nevertheless it is also played privately but for smaller amounts of money and with simplified code of behaviour. Gambling is officially banned in Japan, however Tehonbiki cards are still very easy to get.